What good is a strong impulse if the connection is weak? That may sound like dating advice, but it applies to IoT systems as well! 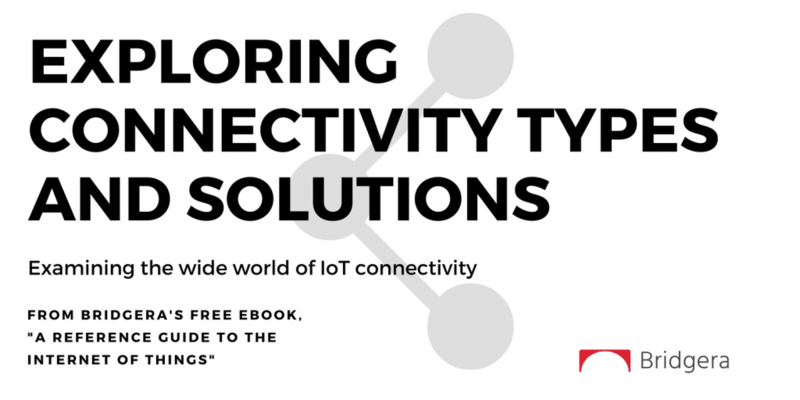 The next segment of our free eBook explains the various connectivity solutions used to transmit data between IoT devices and servers. An internet protocol relies on connectivity to transport data between nodes. Con- nectivity can be thing-to-thing, thing-to-server, or server-to-server. There are several node architecture options. They can range from simple, point-to-point solutions, to complex, sophisticated solutions. 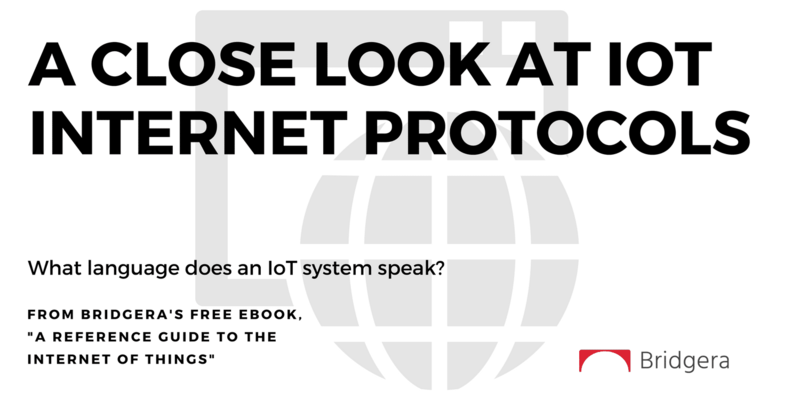 The IoT device communicates wirelessly with a local system using a short range, local connectivity solution. The local system, itself, is physically wired into the internet (e.g. via ethernet). The IoT device communicates wirelessly with a local system using a short range, local connectivity solution. The local system, itself, connects wire- lessly to the internet. A star network has a central node managing connections with many other nodes. The central node is the hub, or access point (AP). The AP connects to the internet, providing the connection for all other nodes. Nodes do not talk to each other unless the AP forwards the message. 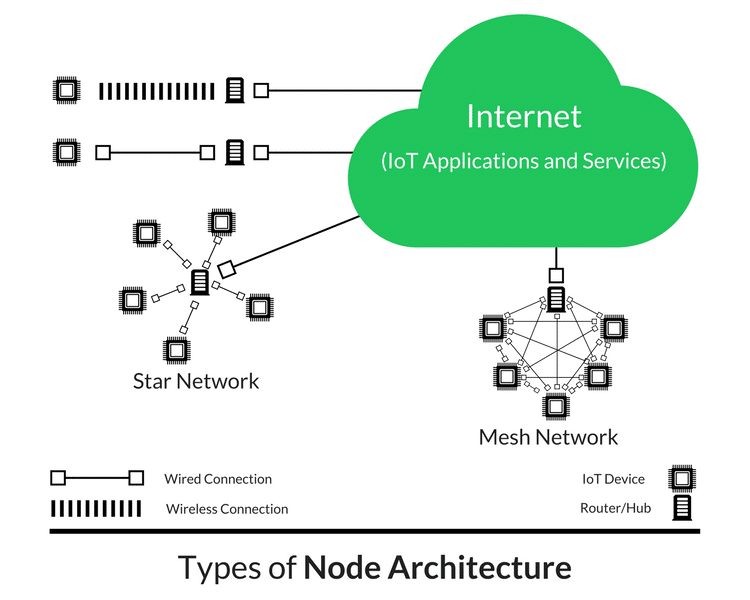 A mesh network allows nodes within a specified range to talk to one another. Using multiple paths from the source node to the destination node, creates a robust network. However, the routing can get complicated depending on the requirements of the system. Typically, the internet connects to only one node in this network type. Environment The operating location of deployed devices. A primary input to design. Input to power, communication range, and serviceability constraints. Size Device enclosure size. If constrained, may introduce constraints on antenna size or power supply. Cost Each sub-system in the IoT system should have a cost target. A primary input often initially ignored but it will introduce constraints everywhere. as bandwidth requirements between nodes. Serviceability Each system will have a finite life or a service requirement. Typically constrained by environment and cost, may introduce constraints on power. Also, drives standard or proprietary technology preferences. Power If main power is unavailable, power becomes a significant design consideration with dependencies on size, environment, cost, data, serviceability, and compute. On-board Processing Requirements for on-board vs. remote processing power, logic and storage capabilities. Constrained by size, cost, and power. Simplex/ Duplex The mode of operation is dictated by Data requirements, simplex (one way transmission, send data) or duplex (two-way transmission, send and receive). Security Like cost, a primary constraint that is too often ignored. Since these devices are connected into larger internet systems, they can become a backdoor for security hacking, etc. Your device transmits mass amounts of data frequently: You will need a high bandwidth solution. Your device is size constrained: Your device’s small size will force you to use a solution that can accommodate a smaller antenna and battery. 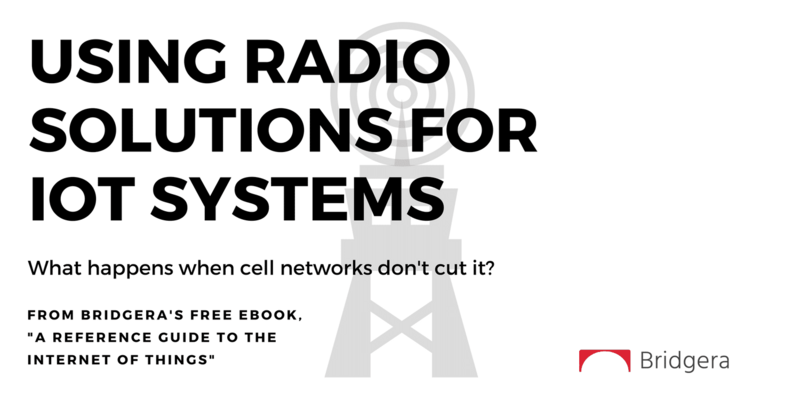 Your device must transmit data over a long distance: Your radio solution will need to operate at a lower data rate, use a lower frequency, implement a larger antenna, or increase your power capacity. Your device must operate for days, weeks, or months without a re-charge of power: You will need to limit the range, reduce the data amount and frequency, and or invest in a more expensive power technology such as high density batteries or energy harvesting.